St Peter was born in Astorga, Spain. He received a good education from his uncle, the Bishop of Astorga. His uncle also bestowed on him the role of Canon of Astorga Cathedral. St Peter joined the Dominican Friars and became a Priest. He was renown for his preaching, conversions and numerous good works. 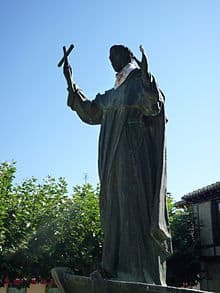 He joined the King of Castile on many expeditions but it is said, that his real reason for doing so, was to travel, meet the poor and preach God’s message. St Peter’s Feast Day is 14th April. He is Patron Saint of sailors. Pray for us that our daily actions will be an inspiration to other peoples faith.